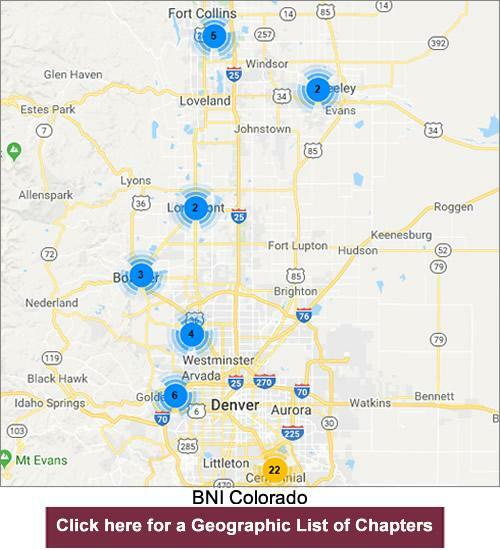 Click here to see an alphabetical list of BNI Colorado chapters in the communities of the front range and northern Colorado including Boulder, Denver Metro and Fort Collins. Click here for information about chapters in Southern Colorado. See the map below for an overview of BNI Colorado chapters. Click here to conduct an "Advanced Search" to locate a specific BNI Colorado chapter. Click here to send an email to visit a chapter. Click here to see the BNI Colorado Premiere chapters.